The Egyptian coffin inside a laser scanner. 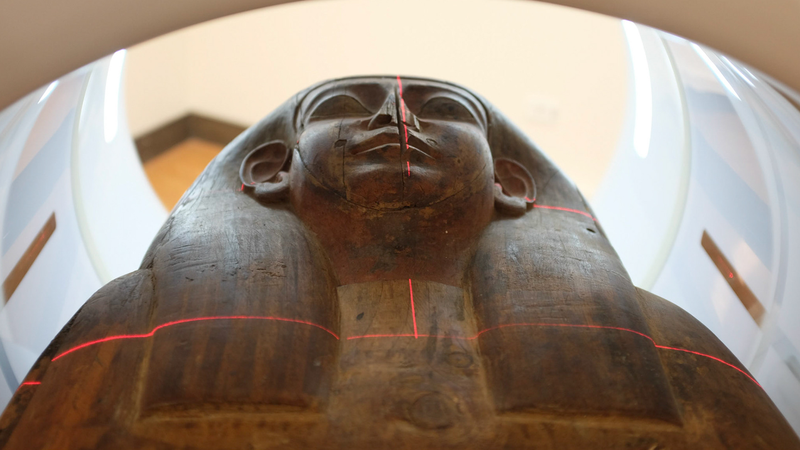 For the past 150 years, the cedar coffin of an ancient Egyptian priestess has been on display at a museum in Australia. Records suggested the 2,500-year-old sarcophagus was empty, so no one bothered to look inside. Last year, museum curators finally opened the lid, and to their shock, the coffin contained an actual mummy—bandages and all. When the lid was removed last year, the curators discovered the frayed remains of a bona fide ancient Egyptian mummy. Using CT and laser scanners, Fraser’s team has now completed a preliminary analysis of the coffin’s contents. The scattered contents of the coffin. To be fair, the mummy is in bad shape, and it’s no wonder the coffin’s contents were listed as “debris.” It’s likely that tomb raiders pilfered the sarcophagus, looking for amulets, jewels, and other treasures. Despite the poor condition of the remains, the researchers managed to pinpoint the location of the torso and several bones (including feet and leg bones, and several ribs), while uncovering bandages, traces of resins, and thousands of tiny glass beads from a funeral shawl. The coffin’s inhabitant died around the age of 30, but it’s not known if this person is the original occupant of the sarcophagus. Inscriptions on the coffin show it dates back to 600 BC, and that it belonged to a priestess named Mer-Neith-it-es. The mummy could very well her remains, but more work is required to confirm this. Looking ahead, the researchers would like to figure out what diseases may have affected this individual and the cause of death, along with clues about diet and lifestyle. The discovery of a body inside this coffin may have come as a complete surprise, but it means archaeologists and curators now get to do some cool science.